In collaboration with the Ministry of New and Renewable Energy, Shakti Sustainable Energy Foundation, and the Swiss Agency for Development and Cooperation, CEEW organised the first National Dialogue on ‘Solar for Irrigation in India’. 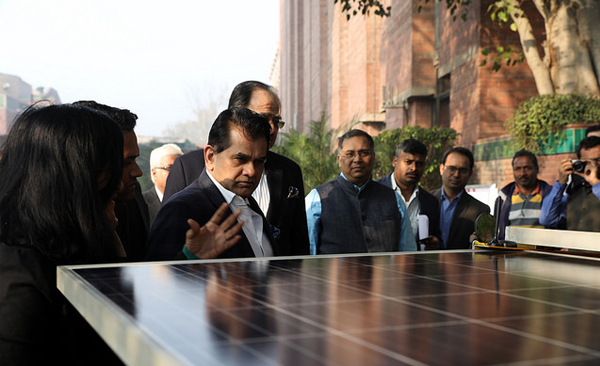 Amitabh Kant, CEO, NITI Aayog delivered the keynote address and released three CEEW studies on solar pumps, capturing three years of research on the subject. The Dialogue brought together multiple stakeholders including researchers, policymakers, financiers, entrepreneurs, and farmers to share their respective experiences and synthesise a way forward for scaling sustainable deployment of solar for irrigation. One of the major highlights of the Dialogue was the live demonstration of a trolley and rickshaw-mounted mobile solar pump, deployed by Claro Energy as a pumping service in Bihar. The opening panel discussion featured grassroots stakeholders - farmers, NGO representatives, and sales representatives of manufacturers. Delivering the keynote address, Mr Kant, said, “Solar pumps can strengthen Indian agriculture by fulfilling unmet irrigation needs while reducing the burden of subsidies on the government and increasing farmers’ resilience to climate change. To scale-up solar pumps, we must strive to create bottom-up demand by focusing on technology demonstration and raising awareness levels among farmers. I congratulate CEEW and Shakti Sustainable Energy Foundation on the release of these studies. These are policy pertinent research studies and present actionable recommendations." He also released three reports ‘Adopting Solar for Irrigation: Farmers' Perspectives from Uttar Pradesh', ‘Solar for Irrigation: A Comparative Assessment of Deployment Strategies’, and ‘Financing Solar for Irrigation in India: Risks, Challenges, and Solutions’ at the Dialogue. Last mile challenges in sustainable deployment of solar for irrigation. Understanding various deployment approaches from the perspectives of social, economic, and environmental sustainability. Risks and opportunities in financing solar-based irrigation systems. The way forward for solar- based irrigation – policy and pathways towards sustainable deployment.